Today we’re back with an iSUP that got great numbers for each review that was ever given to it and that’s of course thanks to many factors. 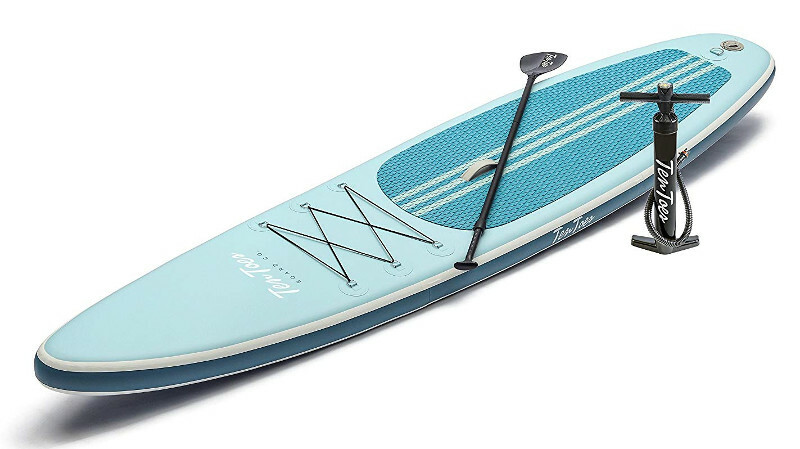 This review is about one of the Ten Toes’ bestseller iSUPs that is known for being a great board for riders with advanced paddling skills who are looking for a little bit of speed and lots of smooth water kniving; the Globetrotter. So, as usual, we’ll be going through the main features of this board in an attempt to share everything you need to know about it. Without any further due, let’s get started. The Globetrotter is definitely not a small board; it measures 12 feet in length, 30 inches in width, and 6 inches for thickness. You might think that it’s a bit big for you, but wait until you see the Jetsetter that measures 14 feet in length. However, if you are a big size rider, this will be just great. Also, I personally think that a small to medium rider will feel safe and balanced on top of this board since it can take up to 250 LBS. Moreover, I always like to mention that a 30 inches wide iSUP is pretty much the best you can get which is a measurement that was never arbitrary. Those 30 inches will allow you to stand tall and comfortable while you paddle through; it’s enough for you to sit or lie down in complete balance. As for thickness, it’s a well known fact by now; the thicker the board is, the better it’ll handle your weight. And again; 6 inches here is top notch. It’ll take hell of a mission to drawn this guy or make it bend once fully inflated. All in all, it’s a pretty luxurious inflatable board if you ask me with all the great aspects to make it so. Real talk now. 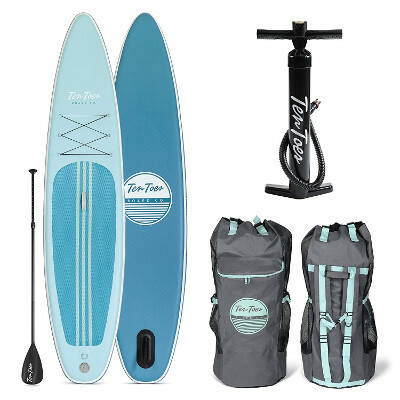 Anyone who’d go for an inflatable board understands the risks he or she’ll be taking, however, companies like the Ten Toes made sure that choosing an inflatable SUP over a hard one is worth your while and money. Let’s not forget the great deal of practicality and functionality presented to us with these iSUP; it was never easier to pack or store such big guys in the back of your car or under the bed. Thus, the Globetrotter is made of military-grade PVC material that is known for making iSUPs nearly impossible to damage. Once fully inflated, you’re going to love how the board feels; it turns really dense, rigid and hard in order to simulate an authentic board that can take some serious beating. 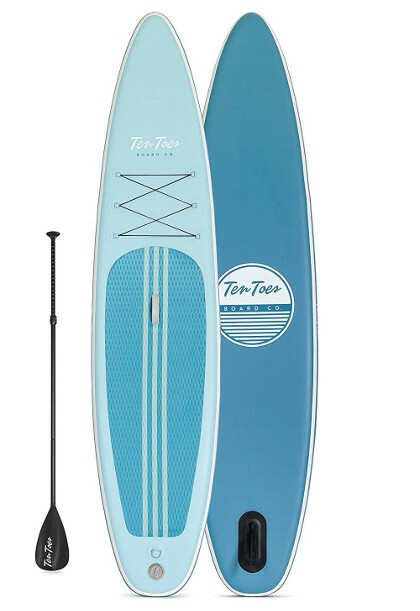 Ten Toes also provides their clients with 2 years warranty to ensure the good built and quality of their boards. It’s a sign actually; a sign that reflects how far the maker trusts his products, and here, I can tell you that they know what they’re doing. This board also comes with a great diamond grooved traction pad that adds to its thickness and density covering the center of the board which is half of its back. It also makes sure you stay balanced on the board even when your feet are wet. Another main feature known to iSUPs is the bungee system; you’ll find a total of 5 rigid D-rings; 4 of which are on the board’s deck and are connected with a bungee cord allowing you to secure anything to the board, while the 5th one is at the board’s end for anyone who needs a safety leash. A central carry handle is also necessary to carry the inflated board around comfortably with one hand; it’s highly functional since it’s made of a rubbery material. Last but not least, every iSUP needs a navigation system that’ll make cruising through the different water conditions a smooth process. The Globetrotter is featured with one large removable nylon fin that makes water tracking nice and fast. You’ll find the deflated board (Duh!) with a strap around it to keep it fixed once packed. An adjustable 3-piece aluminum paddle that is easy to break down and pack. A high pressure hand pump that can inflate the board up to 15 PSI. I’d have said that this is the perfect package, but sadly there is no backpack where you can pack and store the board. However, what you’ll be getting is mainly everything you need to start paddling right after you receive the board. The Globetrotter is mainly a touring iSUP and you can easily spot that looking at its nose; it’s pointy and round to make water resistance almost inexistent which will minimize the effort you ought to make to move faster. I found this board to be extremely responsive in different water conditions which is a huge plus given its size. As for beginners; I can confidently say that anyone can easily get a grasp of how to control this board and even make some water maneuvers with a little practice. However, I must point out the fact that is board was designed for intermmediate to advanced level riders. To wrap it up, the Globetrotter is definitely not a board to be disappointed with. And it comes with 2 years warranty. The only thing lacking thing is a carry backpack which I hope you can do without or maybe you can use an old one if you have any.